A HOME PRO 12 semi-final defeat of the Ospreys was largely expected. Munster have been exceptional this season and coming into the weekend no side had ever lost a semi on their own turf. That said, beating the Welsh region was never a straightforward task and Rassie Erasmus’ men broke down their opponents admirably, emphatically underlining their value for a place in the final next week. Some superb awareness from Keith Earls allowed Francis Saili to launch a long range attack which after a few tidy passes saw Zebo burst away for the match winning score. It was an absolute beauty and a try of the season contender, but this sort of thing isn’t as foreign to Munster as most are suggesting. There’s a perception that Munster play low-risk rugby with an emphasis on the kicking game (similar to Ireland), when In actual fact that’s only partially true. Munster predominantly play to their strengths, one such example being by aggressively launching most attacks with what is an outstanding, hard-nosed forward pack. With ball carriers like CJ Stander, Dave Kilcoyne and Niall Scannell in the ranks, complemented by their tirelessly working teammates, clean front-foot ball is a normality for the men in red. So then of course such a strength will be utilized as much as possible – likewise the luxury of having the best box-kicking scrumhalf in world rugby. Where Munster differentiate from the national side is that they don’t keep a narrow focus on a single philosophy but instead look to make things happen off the cuff. Erasmus has spent plenty of time speaking about this approach as he regularly refers to “trying things.” Without the coaches tendency of being pleased as long as the team give it their best go, it’s likely we wouldn’t have seen moments such as Rory Scannell’s drop goal against Ulster, Ian Keatley’s drop goal against Glasgow or indeed a number of long-range tries such as the one at the weekend. If you’re Scarlets head coach Wayne Pivac and feeling ever so concerned about Munster’s attacking threat, you only have to look as far as the Saracens Champions Cup semi-final for inspiration. Jaco Taute has been a star of Munster’s season, excelling mostly in defence but also in the try scoring department. The South African international has been very direct in his running but to his credit has often taken strong lines into gaps rather than defenders, thus scoring no less than eight tries in 25 appearances. However, against a rush defence that second or so to look up with ball in hand and identify ‘soft shoulders’ or half gaps is limited and so the mobility to step and get around the defence becomes a crucial factor in making a breakthrough. Francis Saili is therefore a more suitable option, but make no mistake, in a regular attacking pattern the Kiwi would be just as ineffective as Taute was in Dublin. Erasmus came out after that defeat admitting his inexperience in adjusting to the different tactics of different opponents, explaining there is really just one template in Super Rugby which is universally followed. He must now learn from his recent eye-opener and work in tandem with Felix Jones to adapt against a Scarlets side that love to get up close and personal. As awkward as the Scarlets pack proved for Leinster, Munster will always back their forwards to do a job in getting the backline within firing range. But once the baton is passed, it is paramount that the backline align with extra depth to buy time on the ball. With the winger in a blitz defence traditionally covering for a kick, Saili has all the All Black X-Factor required to jink on the outside of his opposite number (likely to be Jonathan Davies) and either burst through himself, or at least draw a defender before finding one of Munster’s dangerous wingers in space. Playing Saili’s a risk, his defence is not a patch on Taute’s, but with a rush defence looming, Munster need to find a way to score points this time around and there is only one man of the two capable of making that happen from deep. Francis may not fit the usual Munster strengths but in situations like these, somebody as agile will have to step up to the plate next season and make a difference. Chances need to be converted into tries on Saturday because Scarlets will score themselves. 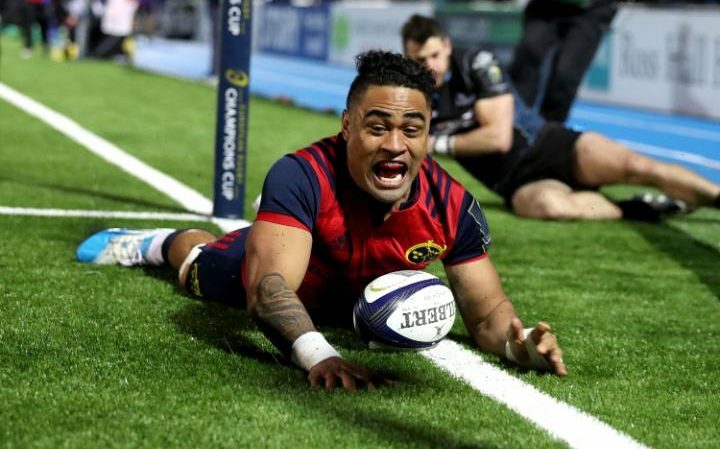 Saili gives Munster the better chance of doing so. Munster may have survived with just 34% of possession against the Ospreys, but Scarlets are a whole new prospect.